"The triumph of Sarah Moss's book is that it returns our attention to the physical and mental experience of attempting to reach the poles. Rather than being absorbed by the aesthetic, this is a book about humans under extreme conditions, and is extremely revelatory not just about their individualized responses - ranging from stoic cheerfulness to selfishness, derangement, and despair - but about the way in which these responses are revelatory of the cultures which formed them." Arctic and Antarctic travel writing has fascinated the popular imagination for the last three hundred years. Emphasizing themes of endurance and obsession, tales from the poles are testimony to scientific dedication, ambition, greed and the often fatal attraction of alien landscapes. Some explorers (Ernest Shackleton, Captain Oates and Roald Amundsen) have become icons of national identity, while others, as famous in their day, fall into obscurity. Polar exploration has also initiated a literature with its own history and development. This book discusses the most influential and popular accounts of polar journeys, from the fourteenth-century tax collector who arrived at the Viking settlement in Greenland to find it strangely deserted to Robert Falcon Scott’s meticulous account of his own dying. Sarah Moss offers literary readings of books by Nansen, Scott, Franklin and Parry as well as bringing to light less famous but equally important works by other explorers, missionaries and archaeologists from Europe and North America. 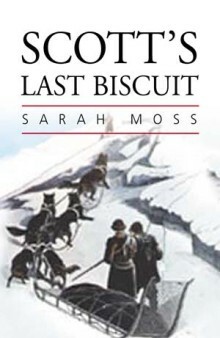 Thematically arranged, Scott’s Last Biscuit considers the morbid fascination of expeditions that go horribly wrong and the even greater interest attached to those that are rescued at the last minute, paying particular attention to the impulse to find and even exhume long-lost travellers. Looking at risks ranging from frostbite and polar bears to starvation and cannibalism, it also analyses the enduring appeal of romanticized polar landscapes, the relationship between nationhood and exploration and literary approaches to polar travel from Winnie the Pooh to Frankenstein. Sarah Moss considers the representation of indigenous communities as well as the little-charted role of women in polar writing. She discusses Jennie Darlington’s unjustly neglected American 1950s autobiography, My Antarctic Honeymoon (“for protection against the polar winds I applied lipstick”), Letitia Hargraves’ moving and likeable journal of life as the wife of a Hudson’s Bay Company factor in the early nineteenth century, and Isobel Hutchison’s solitary travels around Greenland in the 1930s as a botanist for Kew Gardens. SARAH MOSS wrote her doctoral thesis on polar travel writing and English Romanticism. She has recently completed a research fellowship at Lady Margaret Hall, Oxford University, and is now Lecturer in English at the University of Kent at Canterbury.